NASA specialist Michael Moreau has revealed a new solution which the agency is considering to prevent an “Empire state building-sized” asteroid from crashing into the Earth. As the Gizmodo reported, the Bennu ”space traveler” will come dangerously close to our planet in 2135, and scientists have recently been thinking about means to eliminate the unwanted guest. A nuclear strike has been recognized as a probable response according to a theoretical plan named HAMMER, which is short for the Hypervelocity Asteroid Mitigation Mission for Emergency Response. However, the group, drafting the ideas for the worst-case scenario has found an easier way and suggested painting the alien. “Even just painting the surface a different color on one half would change the thermal properties and change its orbit,” Moreau told the media. The sun’s radiation would help, as our home star bombards everything in our system with tiny particles. The Earth is too big to move under its influence, but Bennu is significantly lighter, so we can divert its path by changing its surface. If we paint at least one side, the altered surface will possibly absorb more radiation. 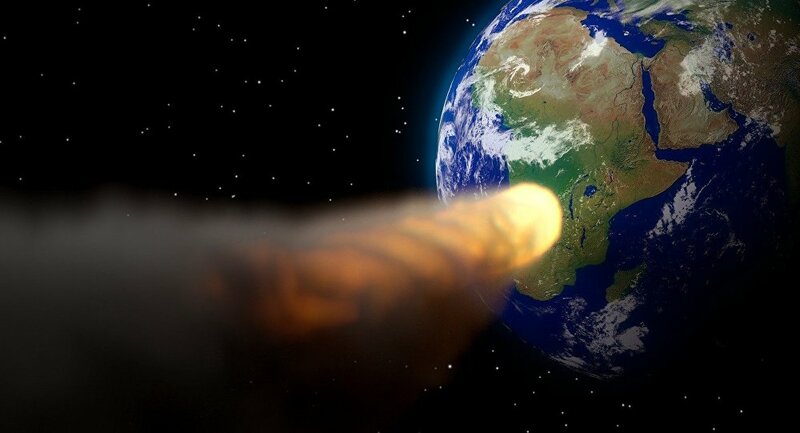 With a slightly different orbit the asteroid will miss the Earth. The scientists say we don’t still know enough about the asteroid, but NASA promises to gather new data with its OSIRIS-REx spacecraft, which is to come back with a scoop of the rock in 5 years. According to recent data, it isn’t big enough to cause an Armageddon, but it’s still dangerously big in comparison to other space guests. One such collision spared the Earth, but still killed the dinosaurs millions years ago. Can Space Junk Help Us Find Aliens?